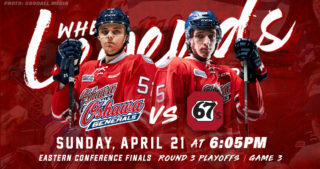 The Oshawa Generals returned from the road to open their weekend at home tonight against the Owen Sound Attack at the Tribute Communities Centre. 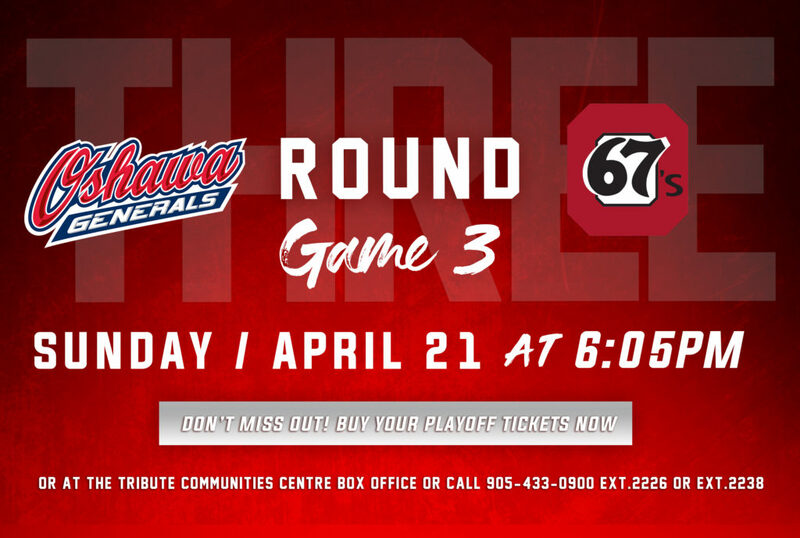 The Gens entered the game with an 8-5-2-0 record after falling in overtime to the Petes last night in Peterborough. Oshawa looked to rebound from the OT loss and grab two points at home against the Attack. The teams were evenly matched to open the period, with both sides generating some offensive zone time and taking the play back and forth between ends. At five minutes into the period, Serron Noel got the crowd into the game early with a huge hit on an Owen Sound defender. Shortly after the hit, the Gens took the first penalty of the game to put the Attack on a powerplay. 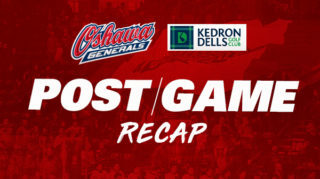 With a strong penalty killing effort, the Gens fought off Owen Sound and the game remained scoreless. Back at even strength, a quality scoring chance for Oshawa came on a 2-on-1 where Noel and Jack Studnicka just missed getting a shot off. With under four minutes left in the period, a scramble in front of the net after the Gens hit the post resulted in Nando Eggenberger chipping in the loose puck to put the Gens up 1-0. Oshawa came close to adding to their lead when Nico Gross hit the crossbar late in the period, but the score stayed at 1-0 for the Gens to end the first. The Gens came out strong to start the second, getting a few good shots on net and sustaining offensive zone pressure. Two minutes into the period, the Attack got called for a boarding penalty, giving the Gens the man advantage. Oshawa wasn’t able to capitalize on the chance and got called on a penalty of their own shortly after the powerplay expired. The Attack made the most of their opportunity and tied the game 1-1 on the PP. Not long after their first goal, Owen Sound added another goal from Kevin Hancock to give them a 2-1 lead. The Gens went on the powerplay with eight minutes left in the period on a tripping call to the Attack but couldn’t get the tying goal. However, the powerplay got another try with five minutes left when Owen Sound took another penalty. 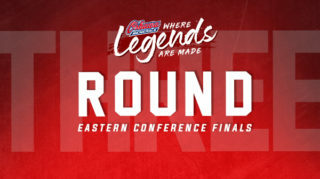 This time around, the Gens made no mistake with William Ennis ripping a top corner shot past the Attack to tie the game at 2-2. The goal marked Ennis’ first of the season, with the assists going to Mitchell Brewer and Cole Resnick. Neither team added to the score in the last minutes of the second, leaving the game tied 2-2 heading into the final period. 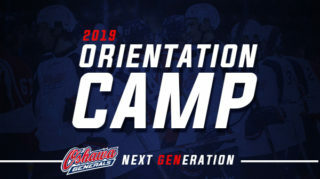 The Gens came out of the gate for the third ready to play, with Jack Studnicka ripping home a beautiful shot just 20 seconds into the period, giving Oshawa a 3-2 lead. After the goal, the Attack received a penalty to give Oshawa a chance on the powerplay but they were unsuccessful on the opportunity. Shortly after the penalty expired, the Attack were able to get one back on the Gens and tie the game at 3-3. However, the Gens came back a couple minutes later with a goal of their own off a perfect point shot by Ian Blacker to regain the lead. The lead was once again short-lived for Oshawa, with the Attack adding their fourth and tying goal with eight minutes left in the game. Things got worse from there for the Gens when Owen Sound scored again with just over three minutes left in the game to take a 5-4 lead. The Attack went on to add an empty net goal to come away with a 6-4 win. 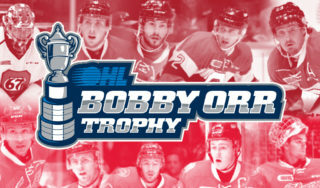 With a tough loss tonight, the Gens will look to get back on track when they play the Barrie Colts on Sunday at the Tribute Communities Centre.